This was the first movie I remember feeling like it was an event when it was released. The internet was in its infancy so the best way to promote a film was still trailers in a theatre, and Independence Day had some of the best trailers I can remember. It teased the epicness of the film so well, and yet, gave away almost nothing about the story other than Earth was about to be visited by some martians who probably don’t have the best of intentions. These awesome trailers did their job, people were lining up to see this epic sci-fi extravaganza on opening day, myself included. I actually had a school camp that ended the day this came out in Australia and I made my father take me as soon as it was over. Due to the minimal amount of sleep I had got during the three day camp, I actually ended up falling asleep during the film, but don’t let that detract from what is a fun thrill ride and a fun throwback to the popular martian films from the fifties, like The Day the Earth Stood Still and Plan Nine From Outer Space. 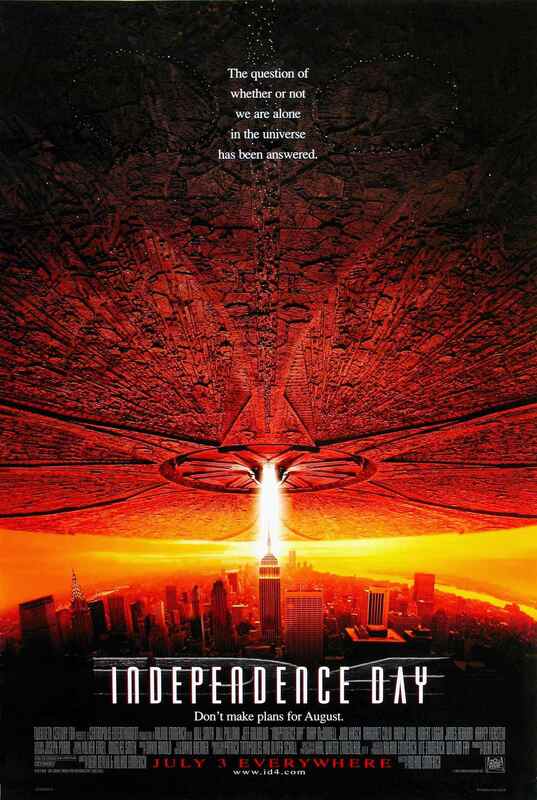 Independence Day (or ID4, as it is regularly shortened to) picks up the day before America’s Independence Day. As people are preparing for their patriotic holiday, flying saucers the size of a city begin to appear all over the world. Citizens react by either welcoming them or wanting to panic. Thomas Whitmore (Bill Pullman), the US President, urges everyone to stay calm, while still being wary of the alien’s intentions. In New York, a genius cable guy, David (Jeff Goldblum), discovers a signal hidden in their cable signal which is a countdown for when the aliens will attack. David and his dad (Judd Hirsch) must get to Washington DC to warn his wife (Margaret Colin) and the president about this upcoming attack. Eventually, it is discovered that the government has known about these martians since the fifties and have been studying them ever since. It is up to David and a wannabe astronaut/air force pilot (Will Smith) to stop these aliens before they decimate the entire human race. This is still an exciting film, even nearly twenty years later. The iconic images of the White House getting destroyed and New York getting blown apart still pack a punch when viewed on screen. The biggest criticism I have heard about Independence Day is that they make it seem like America saves the world with little input from the rest of the world. This is somewhat true, but it is an American film. Also, if this were to happen in real life, the world would likely look to then USA for guidance anyway. ID4 is pure escapism, an exciting alien invasion adventure. The cast is good. Will was still mostly known as the Fresh Prince when this was released. His performance as a wisecracking air force pilot helped launch his film career. Bill Pullman also gives a good performance. His inspirational speech before the final battle is one of the film’s highlights. Jeff Goldblum also became thought of as something of a good luck charm after Independence Day was released. He was also in Jurassic Park recently, and when this movie was also a huge hit his reputation increased with it. Independence Day is a fun adventure with a cast that is charming enough that you care if they live or die, and contains some of the best special effects that the nineties could offer. Independence Day was probably the first contemporary action-blockbuster type movie that I ever really liked. Previous to renting this movie (it wasn’t the kind of film my parents would take two preteen girls to see in the theater), I really only liked Disney movies and a few modern classics that my dad had shown my sister and I when they aired on television (Back to the Future, Indiana Jones, Jaws, Star Wars, James Bond). But this movie featured the Fresh Prince fighting aliens, so I definitely wanted to see it eventually. The VHS also had a cool lenticular cover that showed the White House being blown up from a certain angle, which I’m pretty sure is still in a box somewhere in my parents’ garage. I guess what I’m really saying is that I was a kid in the 1990s, and this movie is totally representative of that decade. While I remember really liking Independence Day as a kid, I can admit that it’s not something that has aged particularly well. It’s fun, for sure, but seeing it after all these years really illuminates just how cheesy this movie is/was. Most of the special effects are fairly blah, considering how good they were in Jurassic Park just three years earlier. The acting is pretty cheesy; it’s not like I expect Oscar calibre performances here, but some of these performances are quite over the top. And speaking of cheesy, over the top moments: Bill Pullman’s pre-battle Presidential pep talk is kind of cringeworthy now (maybe it was even back then?). But amidst all the plot holes and dolphin jewelry and Vivica A. Fox playing a stripper for really no reason other than to show her in lingerie, there is a fun movie here. Will Smith is charming (as usual), Jeff Goldblum is sarcastically fun (as usual), Randy Quaid is a lovable weirdo (as usual). It’s still fun watching the White House explode, and it’s still ridiculously funny to think that we could plant a computer virus into an alien ship (Mac and PCs are barely compatible now. I doubt we could hack into a alien operating system.). Just don’t think too hard about this movie and you’ll have a good time. I don’t know why I can say that about this film and not others, but it’s got to be a healthy dose of nostalgia influencing my review. Independence Day takes me back to the days when I was a kid, even if it’s in a very small way and almost exclusively due to Will Smith’s presence.